Invisible braces are appealing. No one likes an unsightly mouthful of crooked teeth. But compound that problem with a bunch of metal brackets and wires and you will feel even more self-conscious about your appearance. Clear braces make sure that your teeth are getting the attention and help you’ve sought for them without making it obvious to everyone within the vicinity that you’re undergoing orthodontic treatment. Clear braces are versatile. Invisible braces are able to correct a variety of problems, no matter what kind of oral health issue is plaguing your mouth. Dissatisfied with the spaces between your teeth? Embarrassed that your teeth are crooked, out of position, or crowded together? Invisalign can help. Each set of Invisalign aligners, which are designed at the beginning of your treatment, is intended to move certain teeth a certain times, gently but deliberately aligning your smile over a period of time. Invisible braces take less time than traditional braces. You will spend less time in the dentist’s chair when you are under Invisalign treatment. 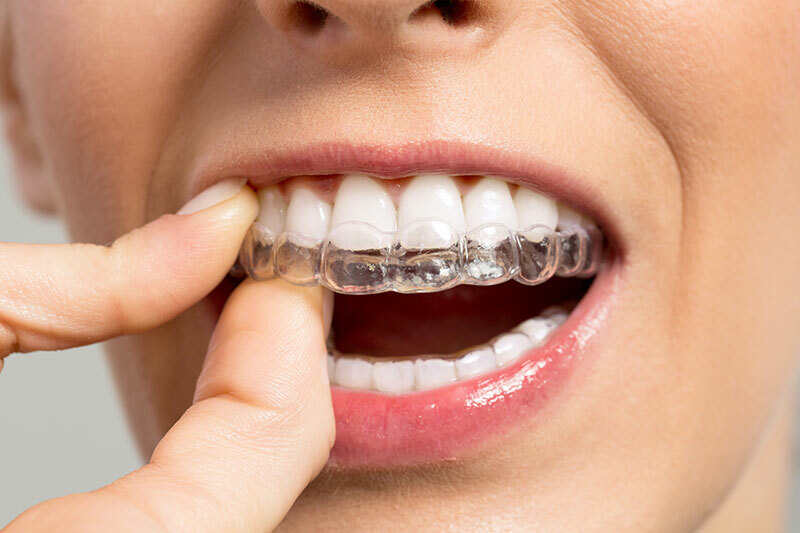 At each appointment, you will be provided with six- to eight-weeks-worth of clear aligners, and it’s your responsibility to wear these as instructed by your dentist so that they do the work intended. With traditional braces, it’s necessary to see the dentist about once a month, and those appointments often involve the painful adjustment of brackets and wires. Invisalign helps patients avoid both pain and discomfort and time-consuming dental appointments. Clear braces can do just about everything traditional metal braces do. Invisalign invisible braces are able to correct nearly every problem that traditional metal braces correct. From underbites to overbites, crooked to overlapping teeth, Invisalign is a comprehensive orthodontic treatment that gets the job done efficiently and successfully. Even if a dentist has told you in the past that you ae not a good Invisalign candidate, it’s time to get a second opinion. Clear braces will permanently align your smile, change your outlook on life, and positively alter your reflection in the mirror. You can eat whatever you want. Diet restrictions may not seem like such a big deal – until you’re the person who has to live with them. When you are wearing brackets and wires on your teeth, there are limits to what you can eat. Crunchy, chewy, and sticky foods are completely off the table. Forget about your love affair with pizza or caramel or even apples. You’re very likely to damage or break a bracket or wire if you risk a food that’s on the banned list. Invisalign-wearers, however, do not have to suffer with any food restrictions. Remove your aligners to eat every meal and indulge in whatever foods and snacks you want. Invisible braces are a magnificent oral health innovation of the last few decades. You can alter your oral health for the better without anyone being the wiser. Your smile will improve dramatically from day to day. You’ll still be able to enjoy all the things you’ve always enjoyed, without worrying about traditional metal braces getting in the way. The clear choice – no pun intended – when you need or want orthodontia is invisible braces. Invisalign is effective, simple, and user-friendly. Find out whether this treatment is right for you. Make your appointment with preferred Invisalign provider Dr. Ken Cirka at Philadelphia Dentistry. Learn whether you’re a good candidate for invisible brraces.